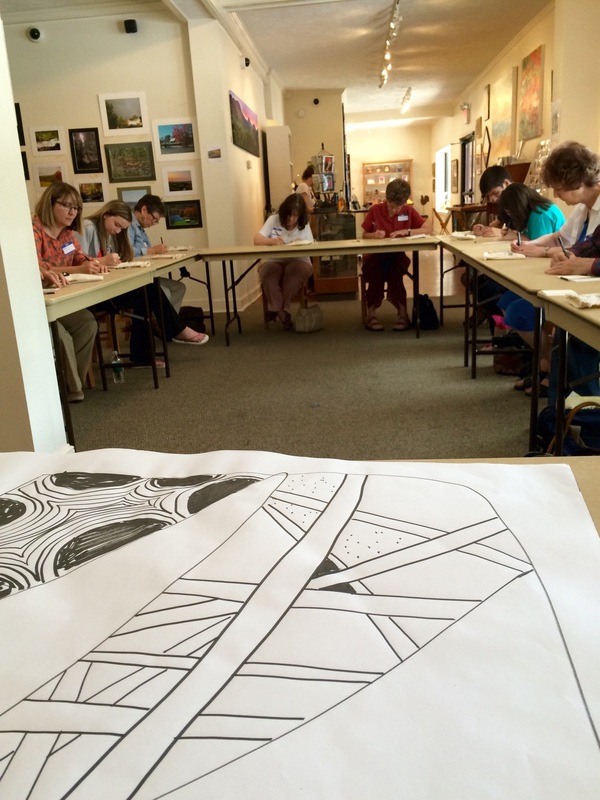 Posted on July 27, 2015 by Kat, aka "ArtyKat"
Well, yesterday (Saturday) I held my first public workshop and it was SO much fun! I had 11 students and each one was so attentive and did excellent tiles (one had her own style but that’s okay!). I introduce Bear as “my lovely assistant” and it was the first of many laughs. They had to fill out a survey for the Art Center afterwards and they raved about the workshop and, well, ME! They thought I was a great teacher! I told them it was my first one but it didn’t seem to matter (full disclosure and all). The only complaint was that it seemed too short -at two hours! Amazing! We decided that the next class needs to be three hours. What *I* learned: I love teaching and I’m good at it and don’t have to be so nervous! I feel this is exactly what I’m supposed to be doing with my life right now. 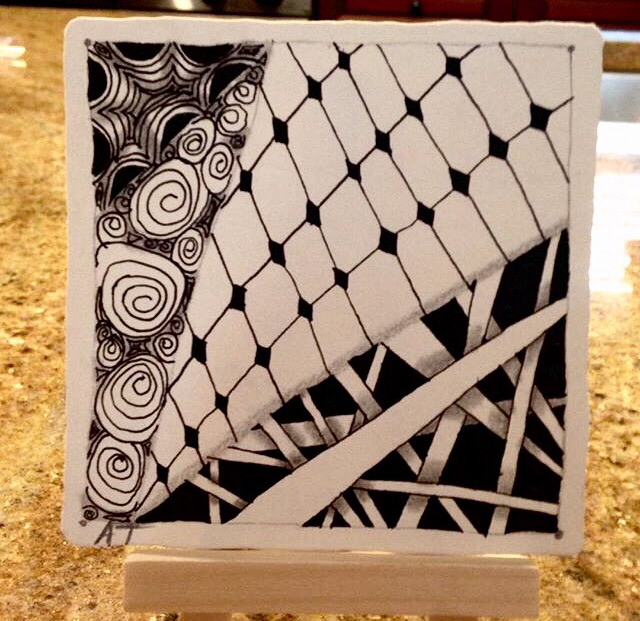 I believe in Zentangle with all my heart and know I’m changing lives by giving them a viable stress reliever that they can use for the rest of their lives. One man was in his 80’s (I’m guessing) and he did brilliantly despite having a shaky hand. I’m so thankful to Rick and Maria for having discovered and founded this method of drawing/stress management/anxiety treatment, etc. deeply grateful. Everyone wanted more workshops so I’m going to offer them. Wish they were already scheduled! Another thing I did was to book the local library for the second Monday of the week from 6-8pm for a free Heart Tangles Of Tazewell meeting! 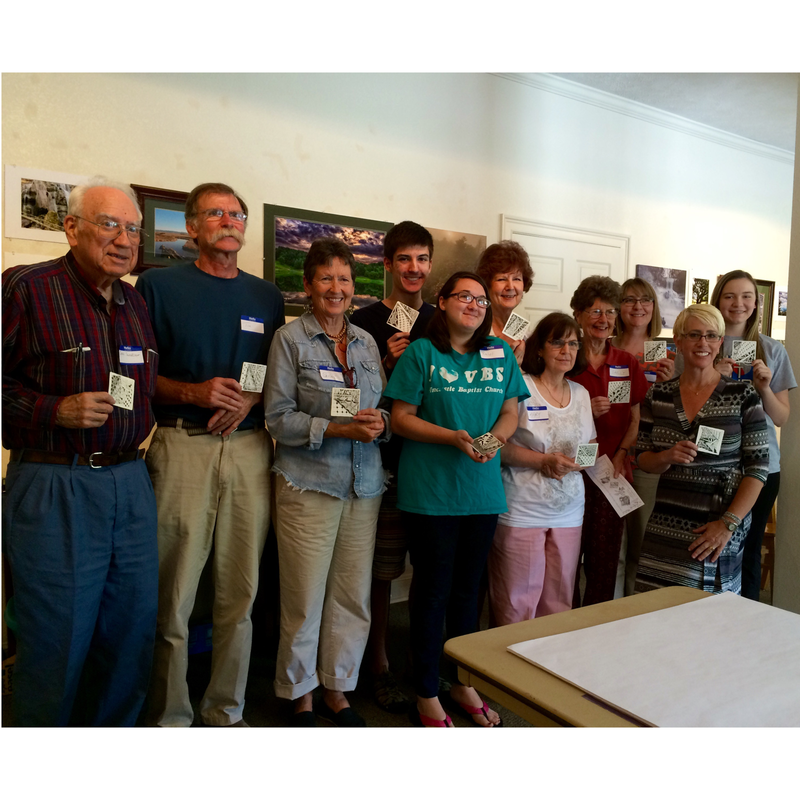 Just a get together for exchanging ideas, showing off tiles and ZIAs and forming a Zentangle® community. When I announced it at the workshop, the Director suggested that we have one there on the first Saturday of the month, so those who can’t attend one can attend the other. Cool, huh? Here are photos from my wonderful afternoon. The mosaic was of everyone’s tiles all together. I didn’t need to tell anyone to photograph it- the cellphones magically appeared instantly! Be sure to click on the photos to enlarge. so quiet you could hear a pin drop! 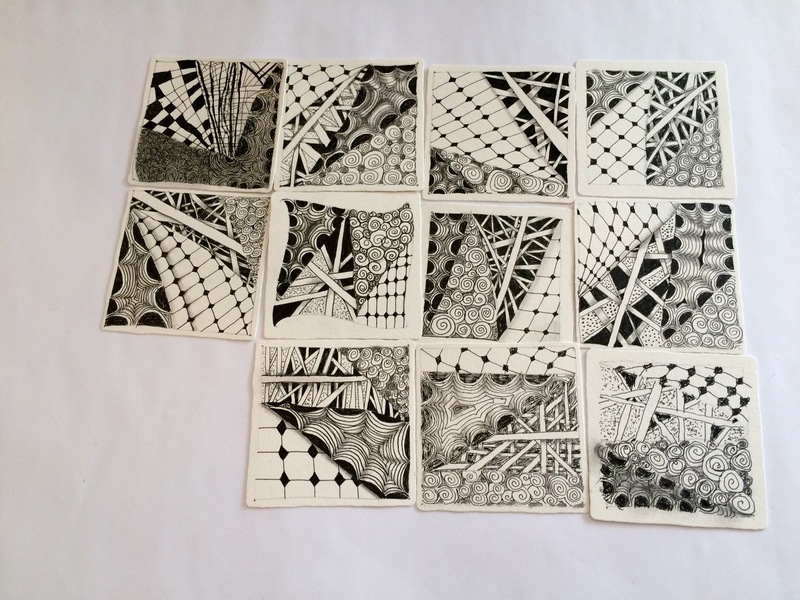 The students would come to the table behind where I lectured (talked) and gather round while I drew each tangle. Then they would go back and recreate it. I would circle in my chair in the middle of the U to look at their work and respond to raised hands. This is my Beautiful! class hard at work. It was dead silent! This is the mosaic— so good! In my class were two teachers, a lawyer and a physical therapist- the rest I didn’t know. Two came from as far as an hour and a half’s drive! Two others came almost as far from a different direction. Only a couple came from our own town. july 25, 2015. I’m so proud of them all! My beautiful first workshop attendees! A girl about 14 did this one and we’ve been messaging today- she is totally addicted! I’m ready to do this again ASAP!